Can You Eat Porkchops When You're Trying to Lose Weight? A weight loss diet that limits calories can be tough to follow, especially when it excludes your favorite foods. That’s why the most effective diets tend to allow for moderation and flexibility rather than laying down strict rules. Not all weight loss plans grant approval to pork chops, but if you’re following a balanced diet that includes all food groups, you can eat them occasionally and still lose weight. The USDA reports that one top loin pork chop has approximately 190 calories, 33 g of protein, 6.5 g of fat, 70 mg of cholesterol and no carbohydrates, fiber or sugar. Of the 6.5 g of fat in the chop, about 2.25 g are from saturated fat. If you eat a sirloin chop instead, you’ll be taking in about 195 calories, 20 g of protein, 12 g of fat and 65 mg of cholesterol. More of the total fat from the sirloin is saturated, at about 4.5 g per chop. According to MayoClinic.com, the best foods for weight loss are those with low energy densities. Such foods tend to have high counts of fiber and water and low calorie and fat amounts. However, those characteristics don’t fit the profile of a pork chop, which has a lot of fat and calories relative to its size. Whereas low-calorie fruits and vegetables might be 85 percent water or more, the USDA says that a sirloin pork chop is only about 56 percent water. 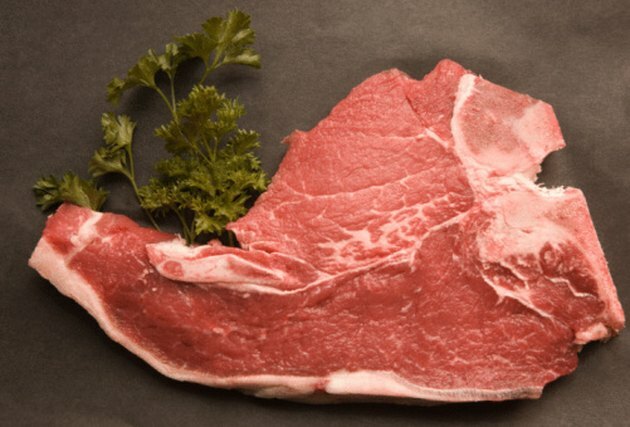 However, chops do have one notable advantage for weight loss, which is their high protein content. Protein tends to be an especially satiating nutrient, so eating pork chops may fill you up and keep you full for longer periods of time than other foods would. A safe weight loss diet, according to the National Institutes of Health, has a balanced foundation that includes daily servings from all food groups. Thus, it’s certainly possible to indulge in small portions of pork chops every so often if you’re also eating vegetables, fruits, low-fat dairy products, whole grains and other lean proteins. The Weight Control Information Network points out that it’s possible to slim down while eating any type of food as long as you can manage to consistently eat fewer calories than you burn. Before you begin any type of new eating plan or weight loss diet, talk with your doctor or a registered dietitian and get approval. Because pork chops are relatively high in cholesterol, eating them regularly may negatively impact your health if you already have high cholesterol levels or are at risk for heart problems.